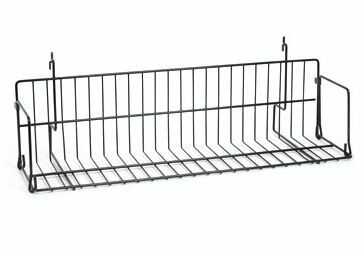 Universal CD shelf can be hung on slatwall, pegboard or gridwall/slatgrid. Tilts back to display CDs, DVDs, Books and VHS at the proper angle. Sold in packs of 10 pcs per color. Colors: black, white. 24" L shelf: holds 5 videos front-facing (approx. 20 total) or 17 videos edge-facing (library style); holds 4 stacks of CD's front-facing (approx. 64 CD's per shelf) or edge-facing (library style). 48" L shelf: holds 11 videos front-facing (approx. 44 total) or 40 videos edge-facing (library style); holds 9 stacks of CD's front-facing (approx. 150 CD's per shelf) or edge-facing (library style).